You did it! After all those years of hard work you are finally graduating! Your high school graduation is a once-in-a-lifetime event that deserves to be celebrated and remembered, so do you really want your high school senior graduation portraits to look the same as everyone elses? Sure, you get a cap and gown photo at school and maybe a couple other images, but will you have a beautiful portrait in your prom gown? Why settle for the boring school photographer when you could have an amazing portrait experience and let your unique beauty shine!! You have SO MANY OPTIONS for a graduation session. We've somehow gotten stuck with the idea that grad photos need to be done on the actual day of grad, but they don't. Here's a few ideas! Casual Session: Some grads like to come in during the fall of their Grade 12 year and do a casual session. This way you will have beautiful portraits to use all year for various purposes such as social media, graduation announcments, invitations, programs, or even in slide shows. 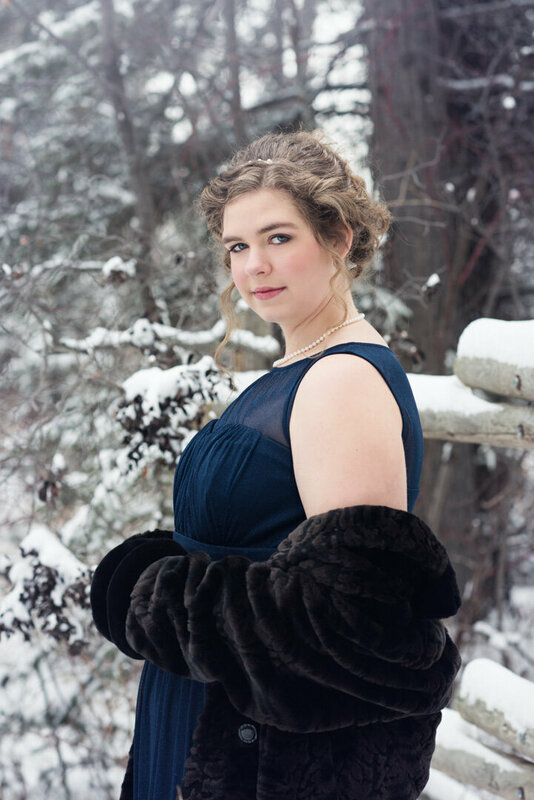 This type of grad session typically takes place outdoors and can be done anytime of year, such as late summer just before Grade 12 starts, during the fall of your Grade 12 year when the fall leaves are in color, or even in the winter, outside in the snow. Prom Gown Session: Most Calgary grads have a cap & gown photo done at school along with a couple casual portraits. That's great, but will you have any beautiful portraits in your prom gown? For most girls this is one of the most special dresses that they will ever own in their life (other than their wedding gown). They spend hours and hours planning and shopping for their gown and their accessories, yet sadly most girls are lucky to get a few iphone snaps in their gown on grad day. Graduation day is usually VERY hectic and it's often very difficult to set aside some time to capture some great photos. I've heard this from SO MANY people!! So here is a fabulous idea. Schedule a hair and makeup test about a month ot two before your grad, and then book a prom gown portrait session for the same day. That way we can take as much time as we need to create some beautiful portraits of you in your gown! Doing your portraits before grad will give you the chance to have your portraits ready to use before grad. You can use them on announcements or invitations, and even have an album or wall portrait to disply at your graduation party. Another option is to book a prom gown session AFTER your graduation. 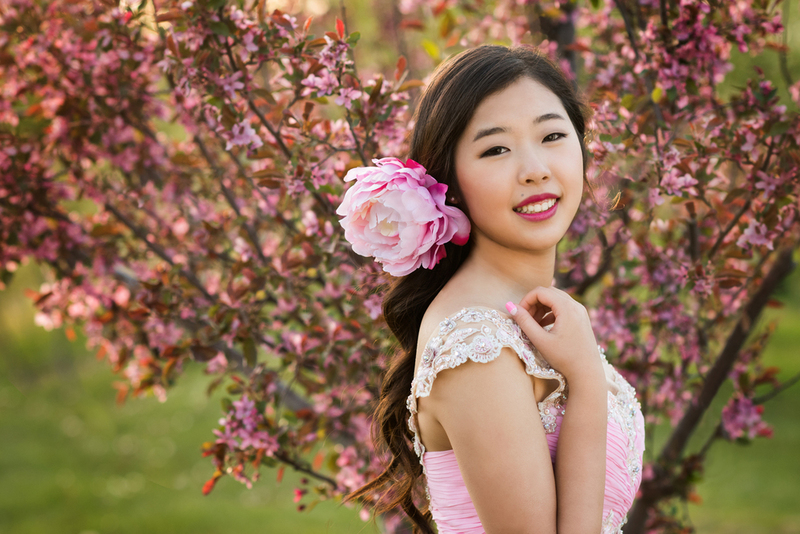 July is a perfect month for outdoor portraits in Calgary since the weather is nice and all the flowers are in bloom. Again, we can take as much time as we need to create beautiful portraits. And it's fun to get all dressed up in your gown again too!! Many of my clients have taken this option. Combination Session: Why not start out with portraits in your gorgeous prom gown and then do some casual portraits as well? This type of session can take place in-studio or on-location and really gives you a wide variety of images to choose from. 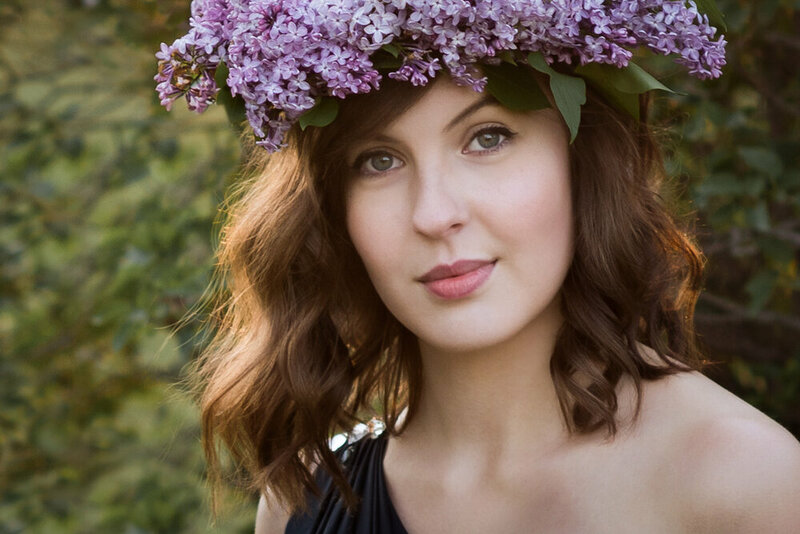 Some grads like to do elegant, glamorous prom gown portraits, and then something fun and casual in jeans or a sun dress, or fashion styled images, or something creative and ethereal. The choice is yours! To create your portraits we will start with a In-Person Planning Appointment. We will talk about what type of session you want. 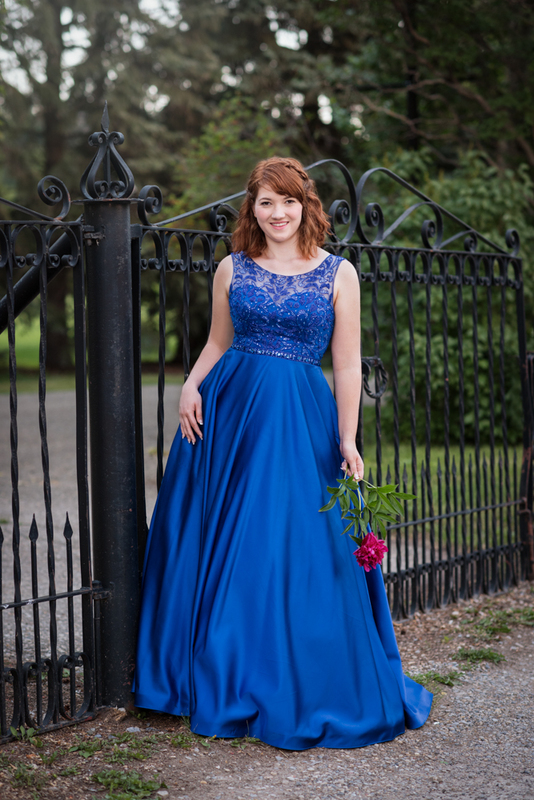 Do you want a casual session, a prom gown session, or a combination of looks? We will talk about the style of portraits you would like, and the type of clothing to bring, and the location of your session. Do you want a casual look in jeans and a leather jacket? How about a cute sundress and a straw hat, or a boho look with a flower crown? Or do you want to look glamorous in your amazing prom gown? Your photo shoot can take place in my home studio with up to 3 backgrounds and 3 outfits. Or it can take place outside in a flowery park, or in the fall leaves, or even in a snowy forest. There are many options so we will talk about them and design your session together. Your session includes professional hair and makeup for one person, so we will talk about that as well. Your planning session is a great way for us to get to know eachother and will help you feel more relaxed and comfortable on the day of your photo shoot. The day of your Photography Shoot starts with your hair and makeup appointment followed by the photo shoot itself. Plan to spend at least 5-6 hours with me! We will have snacks, and there will be lots of girl talk and laughing, and you will feel like a model for the day. It's a lot of fun! If you feel a bit nervous and want to share the experience you can bring your mom along, or even your best friend, but I will do my best to make you feel comfortable in front of the camera. During the session I will be directing you through a variety of poses, including some traditional, some fashion, and some fun ones....but don't worry, they are relaxed and natural. As your photographer, my goal is to make you look your very best! This session does not include any prints or digital images. They are purchased separately, so about two weeks after your session we will meet for your In-Person Portrait Reveal and Ordering Appointment. This is when I will show you the very best pictures from your session and when you can choose your favorite images...but that's going to be hard because you are going to love them all! You can get an idea of what's available here. My goal for your session is to create 20 or more unique images so that you can have a beautiful keepsake folio of the experience. Unlike the one or two photos you might choose from the school photographer I will create a portfolio of images for you. Your portfolio of images is best displayed in a beatiful folio box or album, but your favorite images can also be used for wall portraits, gifts for friends and family, graduation announcements and thank you cards. Plus all of my collections include a cool mobile album that makes it super easy for you to share your images online and be seen on social media! "Thanks Lorraine for the fun High School Grad photo session and the amazing photos you took! It was so much fun to reconnect with you after all these years. You made Emma feel so comfortable during the photo session and the images reflect her personality beautifully!" "This past June I did a graduation portrait session with Lorraine. I was a little nervous leading up to the session as I have never really felt comfortable in front of the camera, but looking at Lorraine's previous work I became very excited. On the day of the photo shoot my nerves came back, but Lorraine was wonderful, encouraging, and reassuring me, and soon I was having too much fun to be nervous. The photo shoot went wonderfully, Lorraine giving me very clear insructions and explaining along the way why certain poses worked better than others for the finished product. The entire evening was amazing and the photos turned out beautifully. Lorraine truly is a talented photographer. I would definitely give her a 10 out of 10 and recommend her service to anyone." "I was getting cap and gown photos at my school, but I wanted something a little more casual and fun. I had two separate photo shoots with Mortensen Photography. One photo shoot was in casual clothes in the Autumn, and another was in my grad dress in the winter. I absolutely loved the experience both times. Lorraine is so good at making you feel comfortable in front of the camera, even if you are a bit shy. I quickly got used to posing and I had so much fun the entire time! The end result was also fabulous! The pictures were beautiful, original, and good quality. She is very good at bringing your personality out and showcasing them in her photos. I have seen many of her other photos from various photo shoots and I can say with certainty that she is amazing at taking photos of all ages and styles. I have yet to see a photo from her that wasn't breathtakingly beautiful."